TACIT reaches out with hearts, voices and guitar strings for charity. determined to put together a phenomenal one night only show to express their support and help lift the financial burden on this important organization. Houston; Bryan Adams; Michael Jackson; and Tina Turner to keeping up to date with the Top 40 such as hits from Lady Gaga; Maroon 5; Bruno Mars; Jason Derulo; Chris Brown; to David Guetta. The Lucky Lucy Foundation is a non-profit organization with a mission to relieve the plight of cruelly neglected and abused township and street animals. The foundation also aim to socially uplift and educate needy and underprivileged children and people around Cape Town. They have been improving the lives of animals and families since its commencement in 2010. Booking is essential as no tickets will be sold at the door. 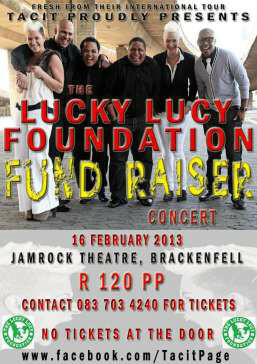 Tickets available from Santina at 083 703 4240. There will be a cash bar and guests are welcome to bring their own snacks or platters. All proceeds goes to the foundation.